Our Pro and Enterprise plans both come with a feature called "domain whitelisting". 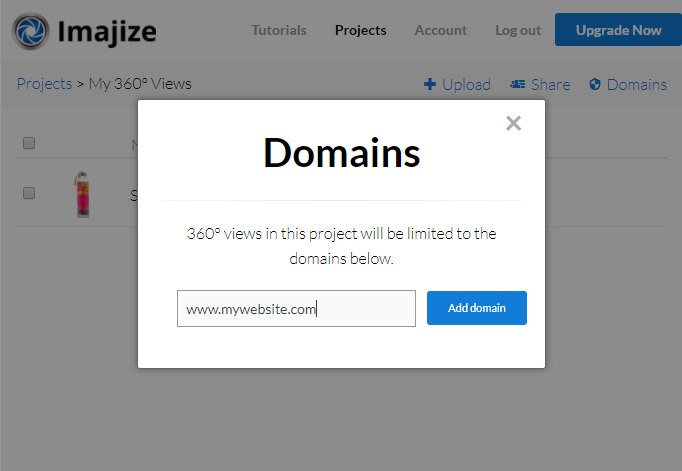 This allows you to specify which domains your 360 views will work on. If your 360 view is added to a domain that you didn't authorize, then it will say "This 360 view is not authorized to work on this domain". Imajize makes it very difficult for your competition to steal your 360 views and source images. Log into your Imajize account and select a project. Whitelisting is set at the project level. In the top right corner you will see "Domains". Click domains. Now simply add the domain names that you wish to whitelist one at a time. 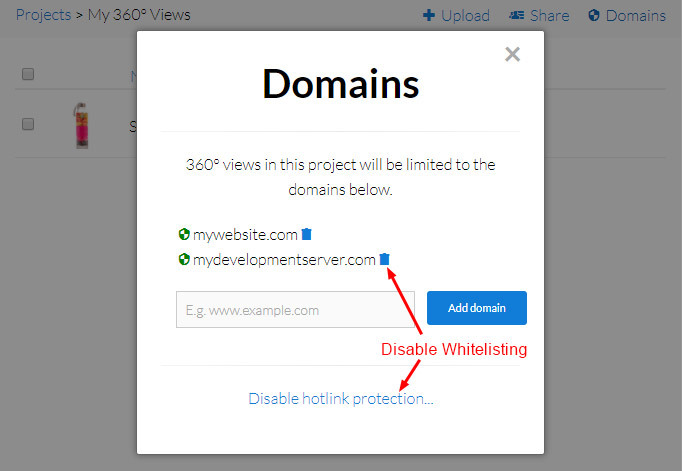 To disable Whitelisting click "Domains" again and either select the small trash can icon next to the domain you want to remove or click "Disable hotlink protection" to turn off whitelisting completely. Tip: For additional theft protection add a watermark to each image. This will make it even more difficult for your competition to cost-effectively steal your images. To restrict it to a single subdomain other than "www", just add the domain including the subdomain, such as "mysubdomain.example.com"
You may also add multiple domains with subdomains, if you don't want to allow all subdomains under example.com.